There are so many places to market your business, it's very easy to miss great opportunities. As you are in your business 24 hours of the day 7 days a week all year, of course, you are not going to see all the many ways to market your business. 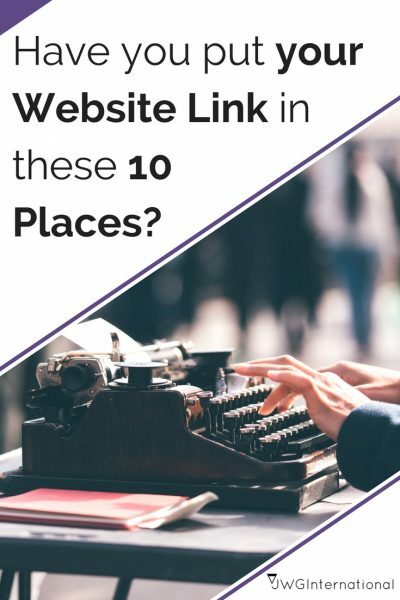 So this post is going to help you see 10 places you may have missed and that you can use to help more people see your business. The most important element of this post is your business url. As this is the ONLY way people can get your business online. Also if you misspell your URL (it can happen) you will lose potential customers too, it's that simple. So be careful in typing out your business url and make sure you can use as many of these places to help increase traffic to your business. Put your business link in your sidebar above the fold. Don't be shy beef up that link with a image saying "click here for shop or check out my shop here". Make it big, clear and add a call to action. Don't just say 'Shop' that's just a label. You have to TELL your readers what you want them to do and you want them to click to visit your shop. As your blog you would think this is the most obvious place to put your business link, well you would be mistaken. I have been to blogs where there has been no links at all. I have also seen blogs where I had to hunt around to find the link. If I was a customer I would not be hunting around for anything. When you have placed your link on your blog ask a friend to get to your shop from your blog. Do they find your link or button straight away? Quick tip: Make your link open in a new window. Here's to do it click here..
As a business, you must be sending at least 1 email a day right? Plus you have your personal email too. So you need to get your business url at the bottom of all your emails. Some times emails get forwarded to other people, all these people will get to see your business url and check out your shop and your blog. You do this by looking into your account settings or email settings. You are using a lot of images of your products, you may be pinning these on Pinterest, flicker, other blogs, facebook etc.. You need to start putting your url on your images so it gets seen . Make it clear and big enough to read. You are losing out if you are not putting your url on your images especially if you are using Pinterest. People are repining all the time, so by having your url on your image people can check out your shop without having to pin or click your image. I'm not going to separate these places as it depends on which ones you are using for your creative business. There are more but I've listed the 4 main big boys. You need to put your business url in your profiles. Each one has a different way of displaying your information so let's look at them in more detail. With Twitter you have 2 opportunities to place a link, one in your description section and one which appears at the bottom of the description Here you can use both places by using one for your business ie: shop url and the other for your blog [places 2 & 3 in the image], that's killing 2 birds with one stone. I'm not really a bird killer just using the metaphor to get my point across. Please no bird killer demonstrations, I like birds really I do :). With Facebook fan pages even though you can put your url in the about section, under the title Contact Info, no one will see it unless they click the about link. You don't have control over whether they do this or not, so you can't rely on this alone. So the next place to display your clickable business url is in the section which is just above the about link [see image 1]. How do you get a link or any information for that matter in this section. You simply click the about link [arrow A] and an information box will open [image 2]. You need to place your information including your business url in the section just under the heading About [arrow B]. To do this click link the edit button and another window opens under the heading Basic Information. You need to put your information and url in the space titled Short Description [arrow C], just type in your url and it will automatically become clickable. when done save changes. With Linkedin you need to go to Account Settings > Profile > Edit Profile and fill in all your details including your business url. Try and share as much business information as possible. Linkedin's the place to be seen by retailers, wholesalers as well as potential customers & people, who may want to a collaboration. There's no better place to be than in Linkedin. Moving on to Pinterest, here your url is displayed on the panel next to your profile image. To get your business url here [arrow A] click the pencil icon, which is the edit button. A information box will appear and you should put your url in the section website [arrow B]. If you are making videos on your products, maybe you are creating slide shows, then your business url needs to be on there. Like Pinterest, videos can get shared all over the internet, so just having your url in the video description box is not good enough. For blog comments, I would share your shop url and your blog url equally 50 50. Even if you have your shop and blog on the same site. You will still have 2 different urls to use. Let me show you want I mean about using your shop url & blog url equally. If you comment on 10 blogs 5 will have your shop url and 5 will have your blog url. This will allow you to get equal exposure to both places. Let me show you want I mean about using your shop url & blog url equally. If you comment on 10 blogs 5 will have your shop url and 5 will have your blog url. This will allow you to get equal exposure to both places. Well, business cards without your business url serve no purpose. When sorting out your business cards proof read them a few times before mass printing. It only takes one tiny error in your url for it not to work. People haven't got the time to figure out which letter or digit is wrong. Check, double check and then triple check :). It's a good idea to have a small batch of postcards or small flyers available for leaving around town. Sometimes you'll want to change it up and not keep using your business cards. Plus with postcards, flyers you can get more on there design wise and place them in some great places. Plus it's more relaxed when passing them out to people you meet, instead of always using your business cards. Your business url can be placed anywhere on these just make sure the text is a decent size, no squinting should be required. Also, remember to use the back, it may be cheaper if you don't but as humans we have a habit of flipping to the back of stuff including postcards or flyers. So use this blank space effectively & leave a lasting impression. You do have return labels on all your orders, right? If no then you are missing some sweet business exposure, so get some labels. Again make sure your url is spelled correctly and big enough to be seen and read comfortably. If you are still using the good ol snail mail method then you need to slap your business url on the envelopes you are using. You can write it on but you do want to be consistent with branding and you want it to still look professional. So print your url on the envelopes in advance so you don't need to when the time comes to using them. Other options are using sticky labels or get a business stamp created of your business url. Then you can simply stamp your mark on your envelopes with ease. Letters pass through many hands before it reaches its destination, let those eyes see your business url as well. You have potential customers everywhere. In the comments share one place you forgot to put your url? Thanks, Janet! Your tips are always very helpful! How are you doing? Written any more books? I’m glad my tips are helping. Oh and how many doll have you collected now? well, I found out today how to put another URL into my facebook page on the “About’ section – properly! Always here to serve your business needs. If you don’t know I will find the answers for you. Thank you for these tips. I have now realized that I overlooked the most obvious place, including my business URL in my email correspondence. Thank you for the reminder. So glad I had the opportunity to read your article. I’m glad my tips helped. Its easy to overlook elements in your business because you see it all day everyday. At least now you can fix what you had forgotten and get your business out there. Thank you. My return address labels don’t have it on, and the labels I use for the customers address only has my logo, not much use without my URL! A few items added to my to do list, thank you! Thanks for a great read, I had only just finished updated linkedin, and had to double check facebook, but it was great to have a simple list to refer to. Great work. I am just having trouble deciding on business cards, do I have BUSINESS cards with business URL and personal with personal blog or just put personal blog on business cards as I am selling on etsy. I really am confused. Joy recently posted…Why I don’t struggle to price my items… and you shouldn’t either! Thank you, I’m glad you could use what i shared. I like your reference of my post to a checklist. About your business card dilemma, if your personal blog is for promoting your business then, have both urls on your business card. But if your personal blog is about something completely different keep it separate. Also make sure that if you link to your personal blog that you don’t share posts that are for your customers. The only reason i mentioned that is because of your post title shared with your comment.